Step 1 Heat the oil in a skillet or saucepan large enough to accommodate all of the poha. Add the potatoes, season with a pinch of the turmeric powder and salt, and stir to coat. Cover and cook over medium heat until the potatoes are just tender, about 5 minutes. Remove from heat and strain the potatoes from the pan, leaving the oil behind. Step 2 While the potatoes are cooking, put the poha in a bowl or fine strainer. Run under a cold tap for 5 seconds, then pour off or shake out excess water. The poha should be well-moistened but not soggy. Add the rest of the turmeric, the lime juice and ½ teaspoon salt, or to taste, and mix well. Step 3Reheat the oil in the skillet over medium-high heat, adding a little more if necessary. When the oil is hot, add the mustard seeds and fry until they jump around in the pan, 30 seconds to 1 minute. Add the asafetida powder and curry leaves. Stir once and reduce the heat slightly, then add the onion and cook until soft and fragrant, about 5 minutes. Step 4Add the peanuts and the green chiles and cook, stirring, until the peanuts and onion are lightly browned, about 3 minutes. Step 5Add the fried potatoes back to the skillet, then lower the heat and stir in the poha. 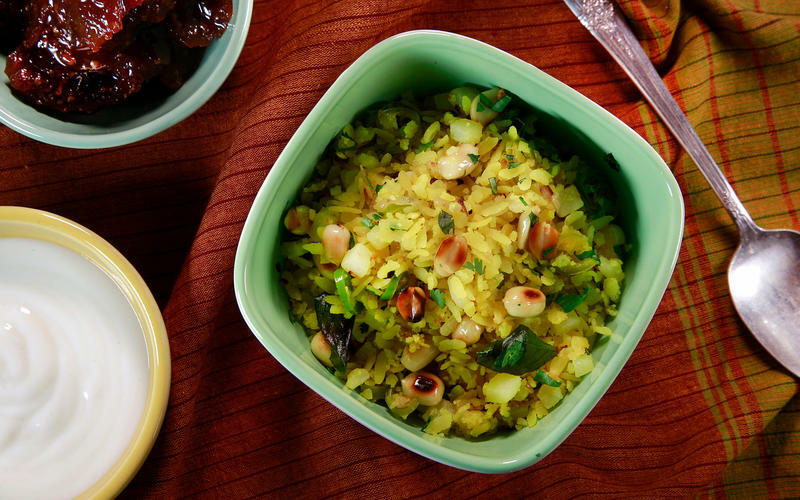 If the poha feels overly dry, add a tablespoon or two of water. When everything is evenly combined, cover, reduce the heat to medium-low, and continue to cook the poha until it is heated through, about 3 minutes. Step 6Taste, adjusting the seasoning with an additional ½ teaspoon salt, or as desired. Remove from heat and stir in the cilantro.Serve the poha with a few spoonfuls of yogurt on the side and your favorite Indian pickle. It is also delicious with poached eggs. In Recipes-list.com we have selected the most viewed recipes from category - . Enjoy the best recipes specially selected for you! Kanda batata poha (pounded rice with onion and potatoes) is the right choice that will satisfy all your claims.